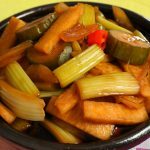 Today’s recipe is something I call L.A. jangajji, a Korean style pickle popular in the Korean community in Los Angeles. I first tasted it years ago when I visited my mom in L.A. She said all her friends were making pickles that way in those days. 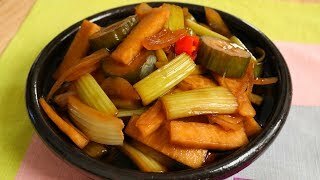 Usually Korean jangajji only pickles one vegetable and is salty, but this L.A. jangajji pickles multiple vegetables and is salty, sweet, and sour. I was instantly hooked on the crispy texture and sweet sour salty herby flavor. When I got back home to Canada, I made this pickle and brought it to work as a side dish in my lunchbox. I shared some with my coworkers, and they loved it. I shared the recipe with them and called it L.A. Jangajji. I hope you enjoy this recipe and these pickles. It’s totally vegan, and you can make a nonspicy version just by skipping the chili peppers. You’ll probably get hooked on this like me, and start using L.A. jangajji everywhere. I just had them in gimbap today for lunch! Let me know where you use yours! You’ll need a thick glass jar. I used my 7 cup glass jar. Combine celery, cucumber, radish, onion, green chili pepper, and red chili pepper in a large bowl. Mix together with both hands. Add the mixed vegetables to a glass jar or an airtight container. Set aside. Combine soy sauce, vinegar, sugar, and water in a pan and stir well. Cover and bring it to a boil over medium high heat. If it boils over, crack the lid open a bit. Uncover and boil for 2 minutes. Pour the hot brine into the jar, directly onto the vegetables. Let it sit until it cools down thoroughly. Close the lid and refrigerate. Let it sit for several hours, then serve with rice as a side dish. You can keep it in the refrigerator up to 1 month. Posted on Saturday, April 7th, 2018 at 5:07 pm. Last updated on April 8, 2018. Posted May 24th, 2018 at 9:53 am | Log in to reply. Look tasty! I will try to cook it definitely! Posted May 15th, 2018 at 8:16 pm | Log in to reply. Absolutely addicting. Decided to make it on the spur. Had daikon, Persian cukes, and sweet Maui onions, but no celery or Serrano or Korean chilis. I used two home grown Hawaiian chili peppers which was enough to give it a kick. We really liked the Persian cukes so will add more of that the next time. 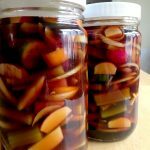 I normally make Hawaiian style pickled onions which is also very good to have with meals, but this LA recipe give it a different twist which we love. Also the tip about adding peeled hard boiled eggs to leftover brine is a great idea. Posted May 3rd, 2018 at 1:33 pm | Log in to reply. Delicious! I added a little sliced ginger since I like it so much. THE BEST thing to do with the left over brine is to put peeled HARD BOILED EGGS in the brine! They are good after a couple of days but better after a week! Posted May 15th, 2018 at 8:19 pm | Log in to reply. Good idea for left over brine…. Posted April 19th, 2018 at 3:10 pm | Log in to reply. Posted April 24th, 2018 at 8:28 am | Log in to reply. Posted April 8th, 2018 at 8:10 pm | Log in to reply. Thank you for uploading this!! I love this banchan (side dish)!! It’s a delicious spicy pickle that works with so many dishes. Posted April 7th, 2018 at 7:57 pm | Log in to reply. Posted April 7th, 2018 at 7:56 pm | Log in to reply. I can’t wait to make this recipe! I’m thinking carrots or lotus root would be delicious, too. Posted April 7th, 2018 at 5:41 pm | Log in to reply. Can I use the brine to make korean pickled garlic? Or do you have a recipe for that? Thanks. Posted April 14th, 2018 at 9:35 am | Log in to reply. It takes months and months to pickle whole garlic cloves. If you want to use garlic, slice it thinly. Usually I’m a garlic person, but I probably wouldn’t use this brine with garlic, because the garlic will overwhelm the celery flavor. Posted April 14th, 2018 at 10:18 am | Log in to reply. Thanks for letting me know. I guess it’s better to buy it then. Thank you. This recipe was originally posted on April 7, 2018 at 5:07 pm by Maangchi. It was last updated on April 8, 2018. The video was watched 207,143 times on YouTube & has 6,942 likes!